One of the most important visual elements found on Montpelier in ca. 1812 were the intricate Chinese railings found on the wings. The inspiration for the Madison-era railings was similar railings used extensively by President Jefferson in his architectural designs. Because Presidents Jefferson and Madison spent much of their lives talking or corresponding almost constantly, it is not surprising that Jefferson's architectural ideas would have been incorporated in Montpelier's ca. 1812 additions and renovations. A ca. 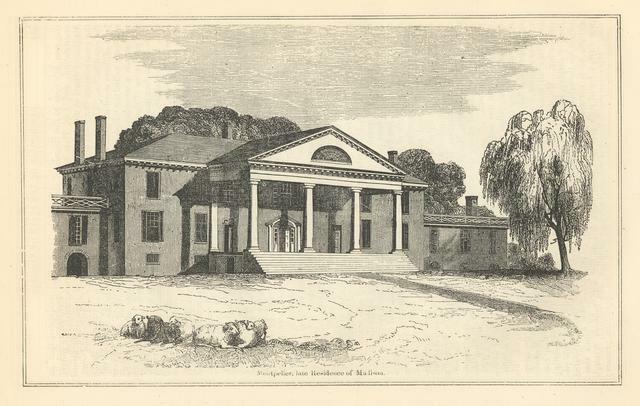 1830 engraving of Montpelier.